Flanked by the Pacific Ocean and the Sea of Okhotsk, Kamchatka is a peninsula which is centred by a range of smouldering volcanoes. The peninsula is located in the Ring of Fire – a circle of active volcanoes in the Pacific – and is perhaps one of the country’s most popular adventure destinations. One of the best adrenaline activities in Kamchatka is heli-skiing, where adventurers get dropped off by helicopters and ski their way down the volcanoes on fresh powder. 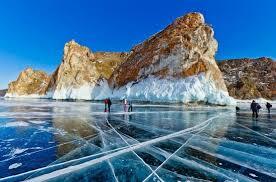 Baikal is the world’s largest, deepest, and oldest lake and lies straight in the heart of Siberia. In the dead of winter, temperatures plummet below -25⁰C, making it the ideal spot to do some ice diving and biking on the ice. Divers come to Baikal for the pristine visibility of the lake’s waters, which is virtually crystal clear thanks to the ice that covers the water like a layer of glass, allowing for optimum light conditions. Located in the South-West of Russia, Mt. Elbrus lies close to the Georgia border near the Caucasus Mountains. It’s officially the highest peak in Europe and stands tall at 5640m, making it any mountain climber’s dream. Climbing Mt. Elbrus is free, unlike most of the Seven Summits of the world. Due to weather conditions, the climb might be a little intense. But hikers reckon it’s one of the easiest climbs as far as technicalities are concerned. Since hiking is one of the best ways to explore Russia’s vast landscapes, it only seems natural that it should be mentioned in this roundup-style post. 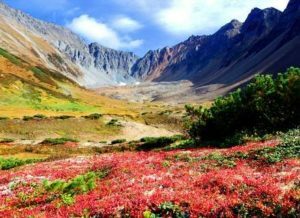 Yes, Russia has an abundance of nature reserves and mountains that are ideal for hiking. But one of them stands out from the crowd. 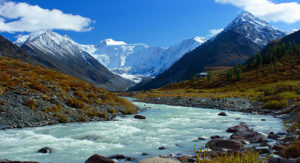 The Altai Region is renowned for its breathtaking scenery and is spread across Russia, Mongolia, Kazakhstan, and China. And rest assured: there’s something on offer for everyone here. If you’re not particularly keen on hiking, you could always try your hand at horseback riding or rafting. The region literally has an abundance of sightseeing options to choose from. From turquoise lakes to mountain rivers. Dense forests and glaciers. Waterfalls and some of the most intriguing caves in the world, you name it, the Altai has got it! Our dedicated team of travel experts is here to give you a helping hand. If you need any more information or if you are interested in booking one of these amazing adventure trips in Russia, feel free to get in touch with us today!